They call it the convention bounce. Donald Trump seems to have gotten one; Hillary Clinton surely expects to get one. 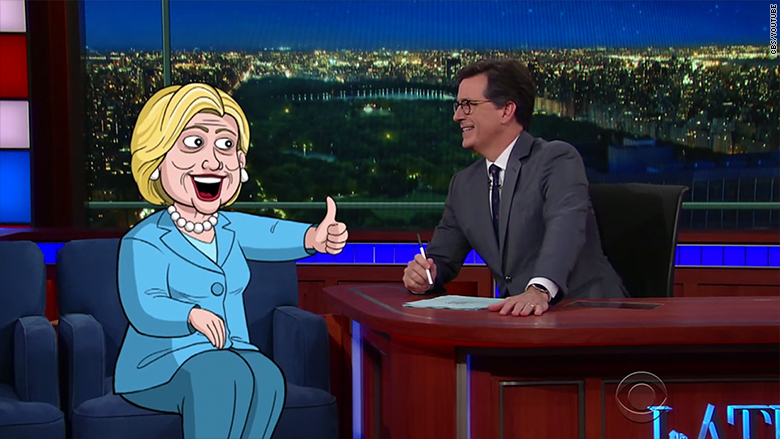 And if all goes to plan, so will Stephen Colbert. Arguably, he needs it as much as they do. With live editions of his "Late Show" on CBS over the past two weeks, covering the two weeks of political conventions, Colbert has generated more energy, more buzz and more digital views than any previous period in his first year on the network -- not to mention some of his best ratings this year. After a run of uneven performances that surprised many of his fans, and even his late-night rivals, who consider him outrageously talented, Colbert clearly elevated his game during the conventions. Maybe that will finally squash the bubbling rumors -- never more than that -- that CBS might consider installing its emerging later-night star James Corden in the earlier time period. Obviously Colbert and his staff regarded the convention coverage as the perfect grooved fastball to pound into the rafters -- if, that is, he could re-capture the spark of anarchic political satire that brought him fame (and Emmys and Peabodys) on "The Colbert Report," his Comedy Central hit. The plan, according to executive producer Chris Licht, was to throw everything the show had at these two weeks. That meant dismissing the cautious approach Colbert adopted when he arrived at CBS, in an attempt to make peace with conservative politicians he had pilloried on his old show. It also meant re-writing jokes up to the last minute every night; introducing original music and extensive sketches in the cold opens to each show; and bringing back both Colbert's old running mate and mentor Jon Stewart and his own blowhard faux conservative character, the former host of "The Colbert Report." Virtually all of it worked -- in one instance perhaps too well. The reappearance of the Colbert character apparently enflamed corporate lawyers from his old employer Comedy Central, enough for them to claim the character was their "intellectual property," and thus no longer belonged to the man who created him. Right now it is not clear what the motivation for the legal move is because both CBS and Comedy Central are refusing to comment either on or off the record. (Viacom, Comedy Central's corporate owner, referred questions back to the cable network.) That only raises questions about why Comedy Central would take such provocative and hostile action against one of the biggest stars in its history -- never mind one who is now starring on CBS, its corporate sibling. It would seem to send a signal to the creative community: you bring your talents here at the risk of seeing them appropriated. The decision is a bizarre replay of the similarly mind-boggling stand taken by NBC in 1993 when David Letterman left that network for CBS. At that time, those two sides, at least, were ferociously contentious, in contrast to this situation, in which Colbert seemed to leave Comedy Central with hugs and kisses all around. NBC insisted Letterman's work belonged to them, not him. The theory espoused was that they might someday sell his re-runs somewhere, but the widespread interpretation was that this was an effort to stick it to Letterman. Naturally Letterman responded with comedy. On his CBS premiere he had then-NBC anchor Tom Brokaw walk on after the monologue, take some cue cards and say: "These last two jokes are the intellectual property of NBC." Letterman went ahead with his Top Ten Lists and Stupid Pet Tricks and other comedy bits he had created on his NBC "Late Night" show. But in fact, he and his staff were worried about what NBC might try to do. Before the show premiered Letterman was in a state of high agitation, even though he went with bravado in his public statements. "One of two things will happen," Letterman said in a press conference. "We'll just do all the stuff that we want to do and that will be fine. Or we'll do all the stuff that we want to do and they'll sue us, and that will be fine. By the way, if that comes to trial, get a seat down front." "Because color broadcasting originated with NBC, all Letterman broadcasts must be in black and white. Guests on Letterman's show may not sit down. That idea originated with Steve Allen. Therefore, all Letterman guests must either stand or squat." Wednesday night Colbert followed the Letterman script, dealing with the challenge through comedy. He introduced a twin cousin of his character and presented his signature bit, called "The Werd" instead of "The Word." If Comedy Central decided to pursue a suit it would be almost as shocking as it was embarrassing. The convention produced some of the top digital results Colbert has seen in his year on the air. Maybe the convention run's best moment, a sketch with the Broadway star Laura Benanti doing an impression of Melania Trump, climbed past 7 million views in a week. 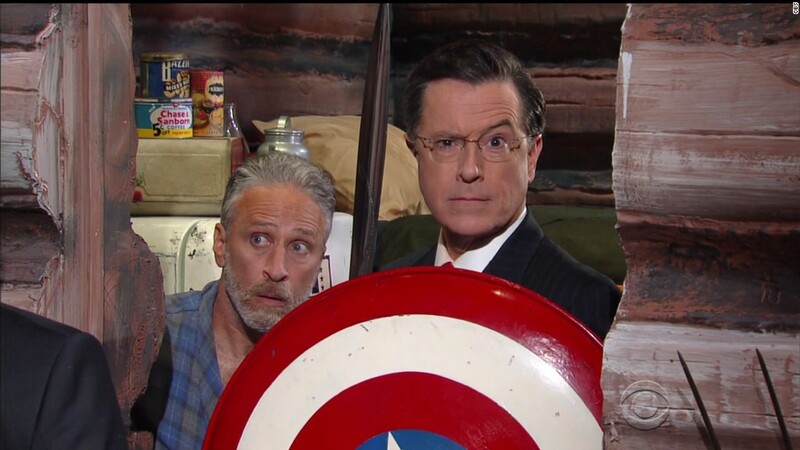 But the high point was the appearance of Stewart at Colbert's desk. That has been good for more than 13 million views to the point. Licht has been instrumental in reshaping the show's approach since he joined in April. He cited the Benanti sketch as a sign of the show's willingness to break the form: that was a cold open that lasted more than 4 minutes. Licht said he was pleased with the results of the past two weeks. "I'm happy the staff feels energized and confident," he said. "It doesn't mean everything is fixed. What is undeniable is weeks like this can build momentum. It's up to us to continue to build on that momentum. That's how shows get better."